What makes a sign ‘expensive’? Expensive is a VERY subjective word, so lets look at the input costs and how that could, would or should influence one’s purchasing decision. 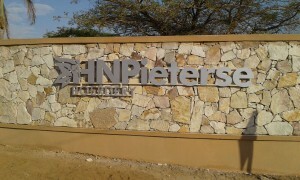 #SignForce, as all sign suppliers, work in a very competitive market. There are generally many sign businesses in a relatively small area, especially as #signage is a low entry cost business. Because of the high level of competition, each sign business needs to have ‘something’ that makes our business ‘stand out’. For the person making the purchase, the high level of competition means one SHOULD be able to compare various options and get the best solution to fit your requirements, although COST, OUTLAY or INITIAL INVESTMENT is often the deciding factor, very often at the sacrifice of long term investment or long term LIFE of the sign. Because COST or INITIAL OUTLAY is such a HUGE determining factor for many buyers, one of the easiest ways to stand out is on ‘price’. It is easy for clients to choose the lowest cost supplier, as, generally, all suppliers will quote to supply the same LOOKING sign. Often how this works is the potential client (or buyer) will send out a ‘tender’, which consists of a picture of how the sign should look. Sophisticated buyers will also supply detailed specifications – which they understand and can check – but this is less common than only supplying a picture and sizes. Also too often the person supplying the specifications does not gave a great understanding of what they are specifying so their ability to ensure that they receive what was quoted could be limited. Because EVERYONE is quoting on the same OUTCOME (read that as picture), when the buyer gets their three or more competing quotes, they naturally assume they are comparing ‘APPLES’ with ‘APPLES’, but because #signs are not standard, off the shelf items, the design, makeup and materials can (and generally will) differ from manufacturer to manufacturer. As such, although all the signs may (initially) LOOK the same when installed, they could, in reality, be EXTREMELY different. In order to explain I am going to use the example of a modular, internally illuminated light box sign with an acrylic face that is illuminated using energy efficient LED lights. I am using a modular frame as we can then assume that everyone that is quoting is using the same external frame, so all the quotes would have the same (or similar) input costs for the frame. Now lets look at the make up of the sign, starting with ILLUMINATION. There are a number of LED’s that can be used on a light box sign. The difference can be anything from in how much light the LED emits (lumens) to the size of the individual LED units (or modules) to the angle of the light emitted from the LED module (especially if the module has a LENS), the expected life of the units and the COST. Because there are so many variables, for the purpose of this article I will compare cost that can vary from about R35 (US$ 13) per meter to about R500 (US$ 186) per meter. It would seem obvious there are a number of variables that affect the cost, but for #SignForce the important differences are (a) the LED’s are the correct LED’s for the job (meaning they will give equal and sufficient light), (b) the expected life of the LED and (c) the LED’s are sure to do the job (preferably guaranteed) so that the business will not have any unnecessary call backs which can be substantially more costly than the cost of the LED’s. Other factors that can have a GREAT impact on the cost include, but are not limited to, (a) the size of the sign (this has way too many variables to reference in this article), (b) the cost of the decoration (print versus cut vinyl versus ink versus paint) (we will only refer to PRINT where costs have a range difference that can easily exceed 500%, with the quality and life span of the print varying greatly), (c) the thickness of the acrylic face (this is influenced by the size of the sign and possibly the location of the sign, and will in turn influence the cost of both the acrylic (the thicker the higher the cost) and the beading that holds (supports) the acrylic face). (d) If the frame is to be painted the make up and application method of the paint can also have a great impact on costs, both due to the large difference in cost of the base paint as well the time and process differences between the various application methods which range from ‘dipping’ to using a paint brush to spray painting and powder coating. At #SignForce we take our guarantee VERY SERIOUSLY, and as such we use materials which, while generally more costly, will have a higher likelihood of lasting and not creating negative comebacks from clients. This does tend to make the initial outlay slightly higher, (historically this is generally no more than 20%), but #SignForce’s logic is that having to redo a sign after three to five years could be substantially more costly than having a sign that does it’s job well for it’s intended life, which is generally seven years, even if the decoration needs to be replaced more regurarly. How LARGE MUST my sign be? What size sign will best convey my message? From how far will people be able to read my sign? In truth, if a sign NEEDS to be visible from a specific distance – because it is located on the side of the road or it will only be viewed from moving vehicles or the sign is some distance from the point where it will be read (to name three of many scenario’s), then there are some rough scientific calculations that can be used to calculate the height the text needs to be in order for the text to be visible from a specific distance, as well as from a distance at speed. 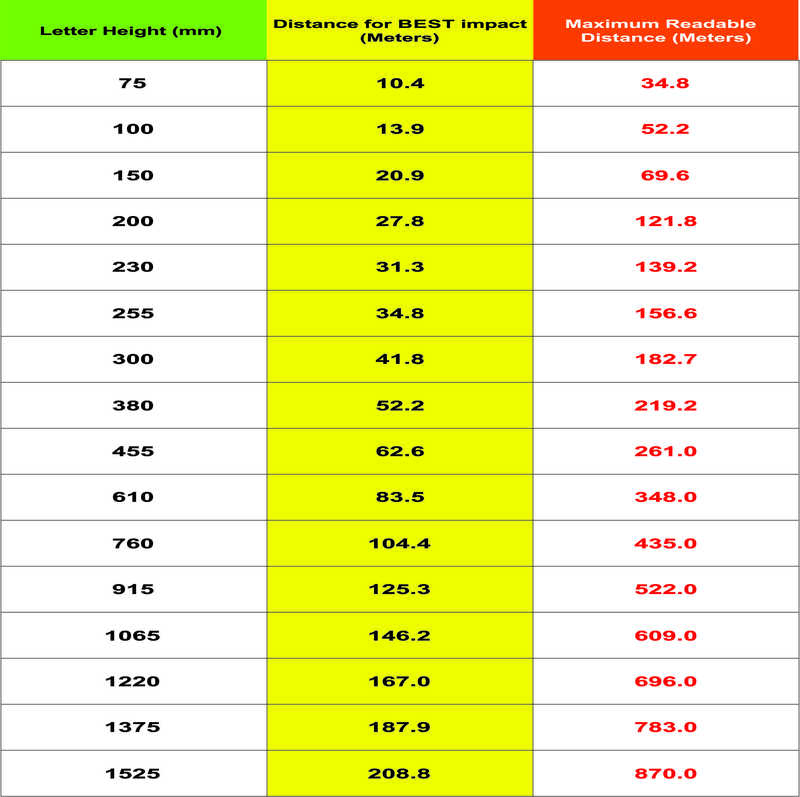 Please remember, at best, these calculations are rough guide, as they do not take into account ALL factors that affect visibility, especially height above the viewer. It is important to remember that the table below refers to LETTER height ONLY. This means that if you have multiple lines of text or multiple words or either of these combined with a logo, the SIZE of THE SIGN will change, with the dependent factor being the DISTANCE at which the TEXT must be legible. Pride is an amazing emotion! It can lead individuals and nations to war and destruction and it – the same emotion – can push those same individuals and nations to unimaginable heights. Pride can also be broken down into a number of categories, for example pride in one self, pride in one’s work, pride in one’s nation and so on. I do believe that is pride in (a) oneself, (b) pride in one’s work and (c) pride in one’s workmanship that leads to upliftment and a desire to excel. I for one take great pride in the work SignForce puts out. I feel an immense sense of pride when I drive down a road and can point out the jobs that I know SignForce has completed. My sense of pride is for more than the mere fact that we have successfully completed a job, it is from HOW the work was completed. 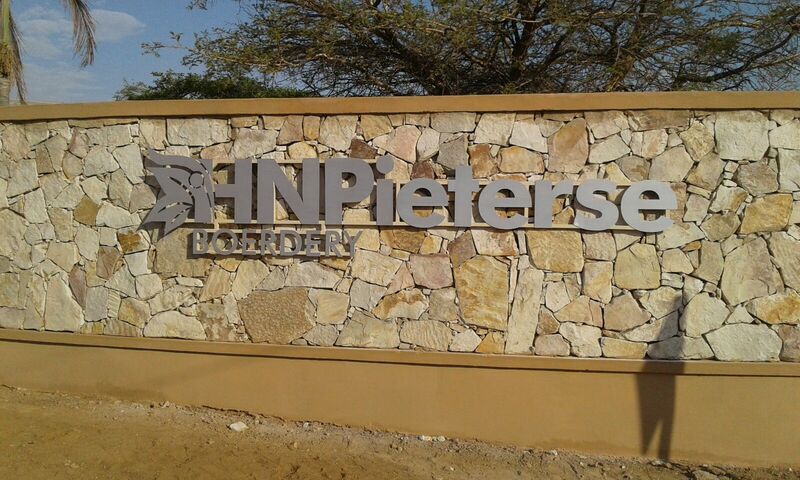 More than the visible workmanship, the thought processes that have resulted in a successful, brilliant looking sign that makes the people who worked on the sign, the owner and SignForce proud. A great example is the accompanying photo. A job well done and worth being proud of. Are all signs the same because they look the same? The short answer is NO. Because they look the same doesn’t mean that any two signs are the same. The reason I can say that with conviction is two fold. The large majority of signs are still made by hand, and since the signs are hand made, there is ALWAYS going to be some variance in the process and hence in the finished product. Historically all signs were hand made by artists and artisans, many of them highly skilled. Today technology has had a huge influence on how signs are made, with wonderful machines that can make multiple, identical copies of the same sign, something that is almost impossible to do when the signs are hand made. Because these machines are expensive, and there are a limited number of businesses that require a large number of signs that are identical, it is still true that most signs are still hand made, hence it is almost certain that no two signs will be totally identical. Also, for example, very few shop front’s are the same size, so unless a sign is small for one shop front, it will not fit into another store front which is smaller. 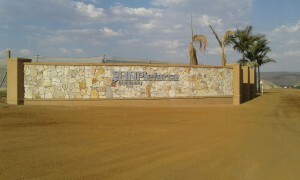 This is one of the reasons we at SignForce refer to ourselves as makers of CUSTOM signs. This is worth remembering when a sign buyer wants multiple copies of the sign. Even the smallest change in a sign – from a 1cm difference in letter height, to the sign being 10 cm shorter, will result in the sign being different. It should look exactly the same – that is all proportions should remain the same, but a small change in one element could, for example, result in a sign being too large for the available space, or a different method of construction being required to manufacture the sign. 2. Signs are generally purchased form a ‘picture’ and while everyone may use the same picture – it is very easy to cut and paste a picture – the manufacturing process, the materials and the expertise of the sign maker will all influence the manufacturing process, and hence the final look, longevity and feel of the end product. Many client’s do not have all the facts of the signage they are to get explained to them, so when they receive two or three quotes from two or three different sign manufacturers, they get a VERY LARGE variance in costing, and because they don’t understand the differences, it is understandable for them to think and believe that they are getting the same sign at different prices – similar to walking into three different stores ang getting three different prices on the same make and model of a kettle. Generally the client will believe that they have given all three sign businesses the same brief, so they expect the signs to be the same. Unfortunately, this is not necessarily how it works in practice. For example, lets assume you are looking for a reception sign, and you tell this to the various sign suppliers, also giving them the size of the sign you desire and the design that is to be used to decorate the sign. Supplier A may quote you for a non-illuminated, 3D, fabricated sign that will make your business look AWESOME, and costs what you may believe to be enough to purchase a small desert island. Supplier B may quote you for a sign that ‘looks’ identical – especially on paper, but, instead of being a fabricated 3D sign, is a printed 3D sign attached to a clear backing board. The look is exceptionally similar, however the cost is vastly different. Supplier C may quote on a sign consisting of a digital print applied to a metal backing. As can be seen from the above, all three sign manufacturers are quoting on a reception sign, so they are all fulfilling the brief. However, the difference in the way the sign will ultimately look and feel, cannot necessarily be seen, especially on a piece of paper – or a computer screen. It is for this reason that reputable sign suppliers tend to specify materials they will be using and give detailed descriptions of the signs they are quoting on, hoping to both ‘educate and inform’ their clients, and at the same time hoping that the client will be comparing signs on a ‘apple’ for ‘apple’ basis. Differences even exist in simple signs. For example, a client may request a metal sign decorated with a digital print, and that is what they may be quoted on, but not all digital printers are made equal, especially when the print is to be exposed to sunlight, because a print from one brand of printer may fade faster and less evenly than another, similar print, printed on another brand of printer. Another point to consider is illumination. When client’s request illuminated signs there are three main methods of illuminating the sign, with the sign size and client’s budget ultimately determining what is to be used. These days signs can be internally illuminated using florescent tubes, neon tubes, or LED’s. The choice would generally depend on the client. For example, while the running costs of LED lighting are lower over the life of the sign (especially if maintenance costs are factored into the cost), the initial outlay for LED’s may be more. Also, there are a variety of florescent tubes that can be used. Wherever possible SignForce use florescent tubes that run off electronic ballasts because the tubes and the ballasts have a longer life expectancy, the running costs are lower, they give off better light and they give off less heat. That said, one can still save money on the initial outlay by purchasing florescent tubes that run off magnetic ballasts, need starters (that tend to stop working long before any other components) and use more energy. The old style florescent tubes will cost less initially, but will generally be a lot more expensive over the life of the sign. Unfortunately, you as the buyer, will very seldom know what has gone into your sign unless you visit the factory, and are explained what is going into your sign, during the production process. Hence it can be seen that not all signs are necessarily created equal. This is at least one reason why sign buyers are encouraged to improve their understanding about the signs they require, and also to stick with sign companies that have a reputation, or at least one with references that can be checked. Why does my business need a sign? While this adage is old to us sign people, it is non-the-less as valid today as it was when it was first uttered many years ago. While it is true that not EVERY business will need a sign – if you are an internet based consultancy, with absolutely no live visitors, how would a sign benefit you? On the other hand, I have recently been approached by an internet based marketing firm – they are so focused on the internet that they refuse to get a telephone of any sort (all correspondence being via email or on their website) – to make them a sign as their suppliers and shippers are having difficulty finding them. This is a business that only sells to on-sellers, and has absolutely no dealings with the public, yet even they feel they need a sign. Since signs are among the oldest forms of marketing, they are a firmly established means of communication a number of points about your business. A sign is considered to be ‘good’ when it clearly displays where you are doing business and / or tells the reader WHAT it is you do. At the same time, almost every sign sends the subliminal message about HOW you as a business, do business – a dirty sign gives the impression you are not concerned about taking care of the finer points. Imagine a fast food outlet where the sign is going black with dirt. How FAST will you walk into that store, especially if the competitor next door has a bright, clean sign? Signs can also be seen as a symbol of success. The larger and more sophisticated the sign, the viewer will ‘respect’ your success as a business. For signs and sign related advise contact SignForce now and one of our dedicated and experienced team will gladly assist you. I am sure we must have all heard about planing. It is that ‘thing’ that we are supposed to do in order to enhance and move our lives forward. This article is not about how to or why to plan. If you want to read some excellent material on planning, how to and why it is important, do a Google search. My current thinking is about how one plans for growth. Sure, it is great to plan to continue along the same path that one has been on for many years, however, as the saying goes, if you continue to repeat the same actions, don’t expect different results. To me planning for growth means pushing one’s boundaries to the point that, instead of the target being just out of reach, it should be so far ahead that it requires a totally different thought pattern and totally different action, but not so far ahead that one cannot see the target lying ahead. Planning need not be engraved on stone, but it should be a guiding light, giving all the steps / milestones / incremental targets along the way for one to be able to measure progress, and see that the ultimate target is getting closer with every completed step. I believe that planning should NOT be step by step rules, but rather a visible and achievable target that is communicated to those that you expect to implement and help achieve the plan. The implementer’s should then be guided and managed, but still left to their own devices, with them knowing what is expected, as it is often quite amazing how people will rise (or fall) to achieve what they know is expected of them. What is the sign expected to achieve? What is the image the sign needs to communicate? With this information it is relatively simple for an experienced designer to design a sign that will fit one’s budget AND project the desired image so the sign can achieve it’s objective. If you are in the market for professional looking signs that will achieve your objectives for the sign at “fair value”, please contact the writer at arnold@signforce.co.za or David at david@signforce.co.za. Please use the subject line ADVISE PLEASE. Business is about relationships, selling and money! For now I am only going to think about relationships. Sometimes relationships are a gamble, not unlike a lottery ticket. Sometimes you buy your ticket, and you simply lose – most often, and a bad investment! Other times you buy your ticket and get a little (or not so little) payback – possibly an excellent investment – generally very rare. And then there are the occasions when you purchase the ticket and get informed that your ticket IS a BIG winner. You get so excited. When you go collect your winnings, you are informed that you have to pay 50% of your winnings to tax. The win was LARGE so you justify the diminished reward by thinking that you should not be greedy. Then the cashier asks if you would like your payout in a single payment now or 20 years in the future. You laugh and ask what that means, only to be informed that if you take the payout now you get 50% of the remaining 50% (after tax) or you can wait the 20 years and get the full amount 50% after tax. It is at times like this that we feel like we are been screwed! At SignForce we believe that in order to spare your prospects and customers this feeling, it is best that they are informed, BEFORE the event, of the potential pitfalls and costs. I find myself often telling this to my seven year old, advising him that negotiating AFTER the fact means he will ALWAYS be on his back (otherwise known as losing) foot. In the world of increasingly fast technology, where people seek immediate gratification, the best service we can provide is to make sure we are honest and up-front with clients. They may walk away because they don’t like what they hear, but in the long run, they tend to come back, because they learn (the hard way) that false promises generally cost a lot more than hurt pride – and the seeds for trust – and a great, lasting relationship – have been planted. If you are willing to hear the truth, SignForce are marketing professionals with experience over multiple medium’s, and we will gladly give you our truth.